Beautiful and sweet! I loved this modern fairy tale of Prince Sebastian and his talented dressmaker. SETTING: Paris, "at the dawn of the modern age"
SUMMARY: Having just turned 16, Prince Sebastian's parents want him to find a suitable bride. But Prince Sebastian doesn't want to get married. He does love dressing up in women's clothes as both an escape from royal life and because he simply loves wearing fashionable women's clothes. 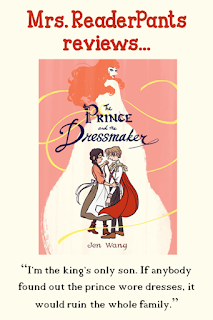 Prince Sebastian hires Frances, a brilliant young dressmaker working in a sweatshop, to secretly make dresses for Sebastian. Frances creates beautiful, unique gowns for Prince Sebastian and helps him to keep his secret: Fashionable Lady Crystallia is really young Prince Sebastian. REVIEW: Awww, this was so sweet! 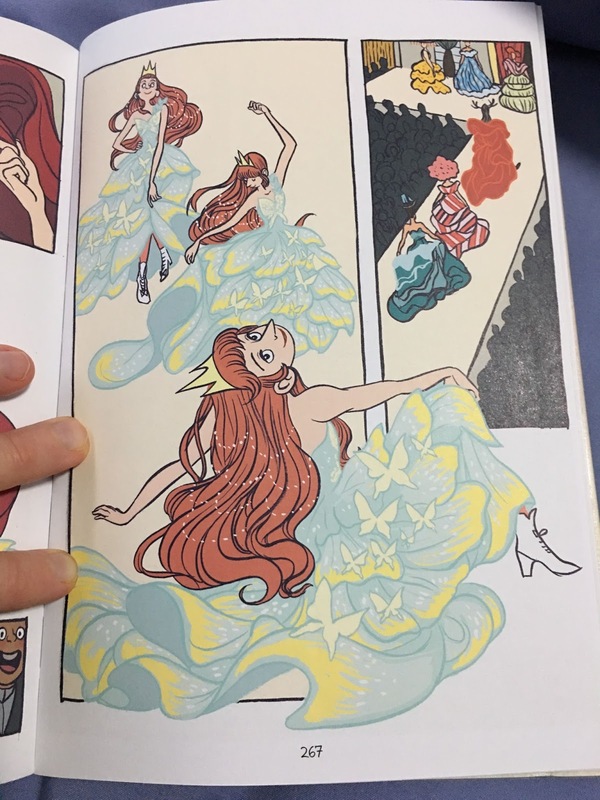 The full-color illustrations are gorgeous, particularly the brightly-colored Parisian dresses that Frances creates for Lady Crystallia, who is really Prince Sebastian. I also loved the facial expressions of Frances and Sebastian, as well as the rich quality of the colors used in the illustrations. My favorite illustration is where Prince Sebastian hugs Frances after they have a huge fight. I just felt the connection between the two characters and how desperately Prince Sebastian loves Frances. I also love that even though Prince Sebastian dresses as a woman sometimes, he is not gay. In fact, he falls in love with Frances, who accepts Sebastian for everything he is. While she is surprised to find out Sebastian likes to wear women's clothing, she takes it in stride and has fun with Lady Crystallia when they go out on the town. The fashion show at the end has kind of a Birdcage feel to it concerning Sebastian's father, the king. I loved that! So this book arrived in my library last week, and I wanted to be the first to read it. I read many of our graphic novels, particularly those that might cause a kerfuffle with certain parents. I would never pull them from the collection, but I need to be informed in the event of a challenge. Yes, the transvestism could raise a stink with some patrons, and school librarians need to make their own decisions regarding that. I do think, however, that times are rapidly changing regarding acceptance of GLBTQIA themes. I am in a Grade 6-12 international school library, and I have no issue adding this beautiful book in my collection. I think my students will love it, and I can see them gushing over how gorgeous it is. Today's young people already seem more accepting of LGBTQIA than they were even just a few years ago. 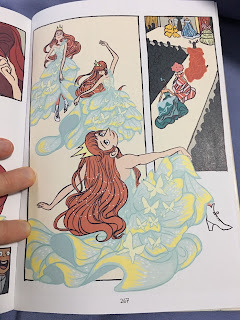 THE BOTTOM LINE: Richly-colored illustrations, a unique story, and lots of beautiful French dresses! Don't miss this gorgeous, sweet romance! STATUS IN MY LIBRARY: We just got it. I predict it will rival Raina Telgemeier's graphic novels in popularity. 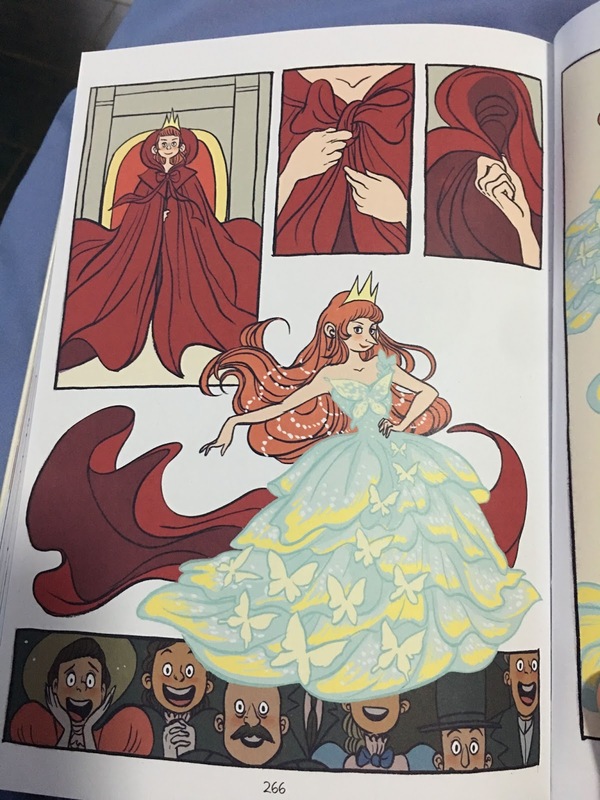 Other: Prince Sebastian wears fancy women's clothes, wigs, and makeup.